When it comes to buying a sleek and stylish luxury car, there are plenty of options. Those who are lucky enough to own one likely understand the importance of shopping around for insurance coverage in order to save money. In the latest commissioned Automobile.com consumer survey, we compared the cost to insure the BMW 3-Series, Mercedes-Benz C-Class and Infiniti G37 sedans. As it turns out, the G37 sedan was the cheapest to insure with an annual average insurance premium of $875.00. The 3-Series followed closely at $897.43 and the C-Class rounded out the survey with an annual average premium of $1099.60. Interestingly, the C-Class vehicles included in the survey were the oldest with an average age of 4.2 years. The G37 average age was 2.8 years and the 3-Series models rounded out the survey at 2.3 years old on average. The most significant finding behind the cost disparity turned out to be centered on resale value. When comparing the Kelly Blue Book resale averages over the past two years, the C-Class fared the best at a value drop of only 15% from 2010 to 2012. The G37 and 3-Series were higher at 21% and 29%, respectively. This is likely one of the most significant contributing factors to the insurance cost disparity, as vehicle value plays a big role when providers assign insurance premiums. Additionally, the original MSRP could influence rates if the vehicle is brand new when the owner applies for a policy. Of the three, Bloomberg reports BMW sales rose 21% during October in the U.S., cutting into the lead currently enjoyed by Mercedes-Benz. 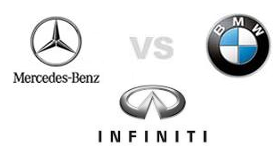 Infiniti (owned by Nissan) saw a 28% increase in sales over the previous year, according to the Japanese automaker. Automobile.com recommends all potential car buyers and current owners compare insurance rates using an unbiased resource in order to receive the best deal on coverage. Additionally, those in the market for a new vehicle can use comparison research when comparing makes and models.